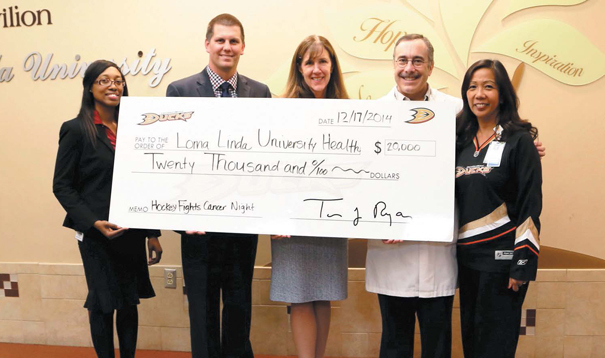 The Anaheim Ducks Donate $20,000 to Loma Linda University Health to Support Cancer Services. Pictured (L to R) from the Anaheim Ducks organization are Christian Young, Corporate Partnership Activation Coordinator, and Graham Siderius, Corporate Partnership Director. Joining them from the Loma Linda University Cancer Center are Judy Chatigny, Executive Director; Dr. Mark Reeves, Medical Director; and Lexine Thall, Director of Patient Care. As part of an ongoing partnership, the Anaheim Ducks recently presented Loma Linda University Health (LLUH) with a $20,000 donation to support patient services provided by the Loma Linda University Cancer Center (LLUCC). The funds were raised by the National Hockey League (NHL) club, Anaheim Ducks players, and fans through “Hockey Fights Cancer” night on Oct. 22, which included the sale of miniature hockey sticks signed by players and an in-game auction of Ducks memorabilia. The “Hockey Fights Cancer” night is part of the NHL’s ongoing initiative to raise support and awareness for one of hockey’s most important fights. With lavender serving as the official “Hockey Fights Cancer” color (representing awareness for all types of cancers), the first 3,000 fans that arrived at the Oct. 22 game received lavender ribbons to wear for the game. Fans also had the opportunity to obtain “I Fight For” cards, which they used to fill in the name of loved ones who have been affected by cancer. During the game, there was a special moment of recognition, in which attendees held up their “I Fight For” cards to honor the person they knew battling the disease.